For several months now, I’ve been a lurker in Coach Jim Lafferty’s Puke Session group in Facebook. But I never dared join them in their running sessions for two reasons. First, the group’s name intimidated me. Last Thursday, Jehan and I braved ourselves and decided to attend our first Puke Session. We came in 10 minutes late, because I was jittery and had to pee in the nearby Starbucks. The “pukers,” that’s what they call themselves, have already finished their warm up run and were already stretching when we came. I said, “Hello, we’re first timers.” And Coach Jim said, “Welcome! Everybody’s welcome.” The rest of the group didn’t say a word or even look up, like they were all saving their energies for something. Then Coach Jim told of a mother who could lift a car to save her child in danger. How? By muscle fiber recruitment by which the CNS recruits muscle fibers to accomplish a given task. It enables the CNS to adjust its power output according to the need. 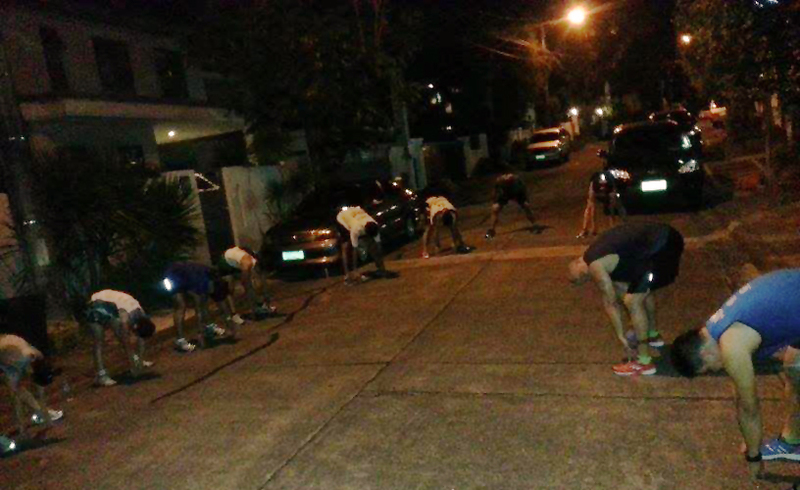 For the night’s session, we needed to recruit as much muscle fiber as we can, even when the legs were already fatigued. Then we were grouped, according to speed, and each was given a rope. Each member should hold on to the rope while running. One cannot and should not let go of the rope. We were to run 3 x 1,800m repeats. For each repeat, Coach assigned a faster pace for each group. At the end of the 3rd repeat, he told us to run 1 x 800m and 1 x 400m without the ropes. For the first 1,800m our group, (Jehan, Mars, and myself) came in last – which was ok, I guess. On the second repeat, Mars joined a faster group and Coach Jim joined us! There were three of us: Jehan, me in the middle, and Coach Jim on the other end of the rope. I confess: I was terrified. I was terrified that he would run so fast that I won’t be able to cope. So I ran as I have never run before in my life. My head and chest hurt. I asked Coach, “We don’t do a run-walk anymore?” I immediately wanted to take back what I said. How could I ask that stupid question? We were doing speed-work. No run-walk for pukers! But he was kind enough to say, “Just communicate if you need to walk.” He also said that my breathing was shallow. Ah, maybe that was why my head hurt. He also said that if I continue with the high intensity training, I’d lose a lot of weight. Ok, I admit it, I was the fattest in the group. Haha! The course wasn’t flat. On an uphill, I asked Coach if we could walk. We did, for about 3 seconds and I said I was ok. He said, “Good!” and we ran up again. Then I let go of the rope because I was exhausted and the rope was getting heavy. But he told me to hold on to the rope and I did, thankfully, because it forced me to run with them until we finished. Whew! Last run was a 400m. Again, I didn’t join them. Afterwards we did some stretching and then Coach gave a few announcements. He shook my hand and said, “I hope you come back.” After that he went inside his house and locked the door. No nonsense. The Puke Session was over. No, we did not vomit (well, almost), but Jehan and I survived our first Puke Session. We drove silently back home. Tulala kami. At times she’d blurt out, “Grabe!” Yep, that’s the correct word for the night. Grabe!!! The next day, my body was sore but my spirit was high. Ah, now at least I have an idea of what a Puke Session is all about. When Coach Jim says, “Be ready to hurt,” that is what he really means. Right now I’m preparing my mind so that it will be in a better shape for the next session. I need to redeem myself, not for anybody else but for me.